Recently I’ve been loving cooking with robust, gutsy greens. Kale is one of them, and I didn’t eat a lot of it in Australia but it’s really common here in the U.S. This is a really yummy and satisfying dish that is perfect for a weekend breakfast or Sunday brunch. It’s not so much a salad, but a stack of various elements which each have their own seasoning. 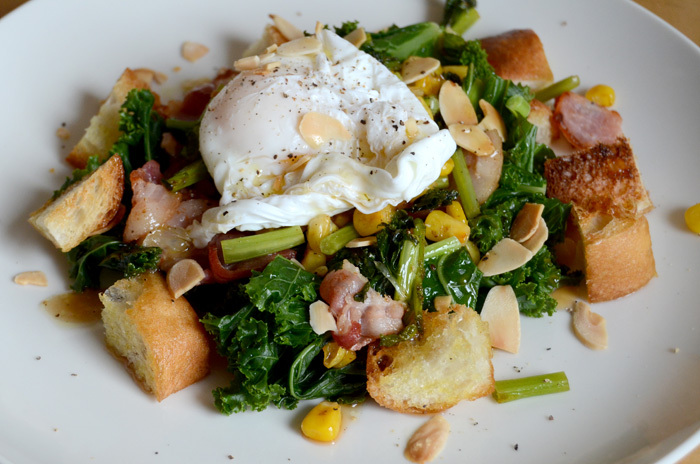 The slight bitterness in the kale cuts through the crunchy almonds and sweet maple bacon, and altogether it tastes really healthy! It might seem like there are a lot of elements, but the recipe is written so you are doing two or three things at a time — it shouldn’t take too long. If you can’t find kale, you can replace it with any greens that can hold their shape, like tuscan cabbage (cavolo nero), rabe, or collared greens. Line a roasting pan or tray with some aluminum foil. 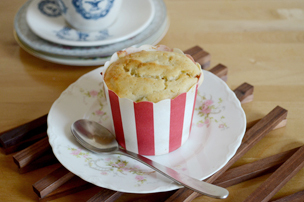 Cut the bread into large chunks (3cm cubes), and spread them out on the tray on one side and drizzle with olive oil. Spread out the almond slices on the other side and place under the grill. This won’t take long, so be careful not to burn it! 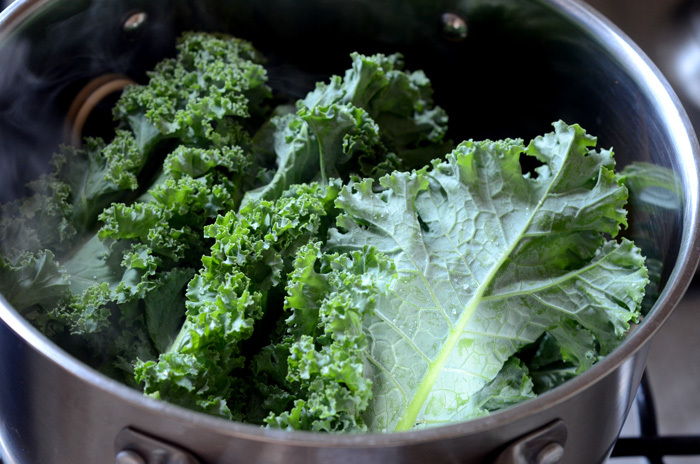 Put a pot of water on the boil for your kale. Cut the hard stalks off of the kale and proceed to steam or boil. I like to use a silicon steaming tray with a large pot with about 5cm of water in it. It boils much faster and all the nutrients stay in the kale. Make sure you salt the kale at this point. 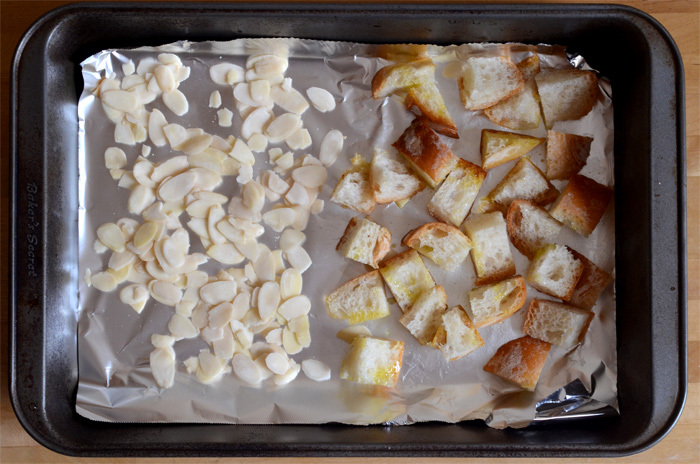 Remove the croutons and almonds from the grill and set aside. Take them out when the stalks are cooked through (you’ll see a white dot if they are not ready) and leave them to cool on the chopping board. 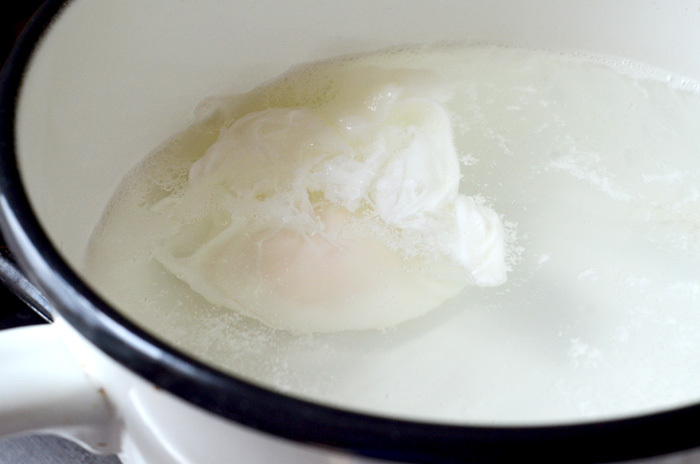 Put a pot of water on the boil for the eggs, with water about 10cm deep. 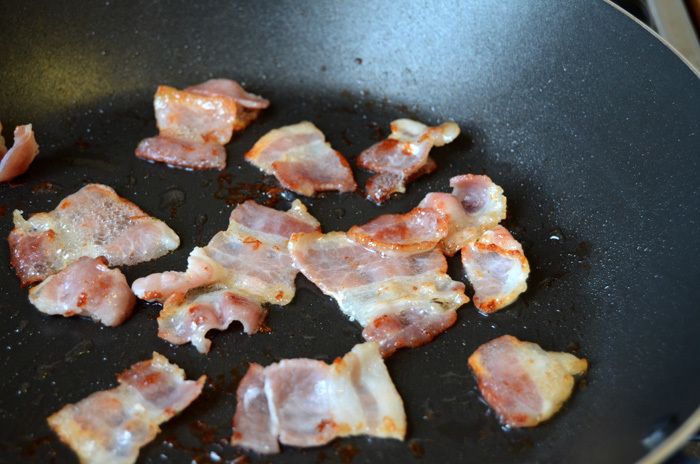 Cut the bacon into 3cm pieces and remove any large portions of fat. Fry them on a hot dry pan. 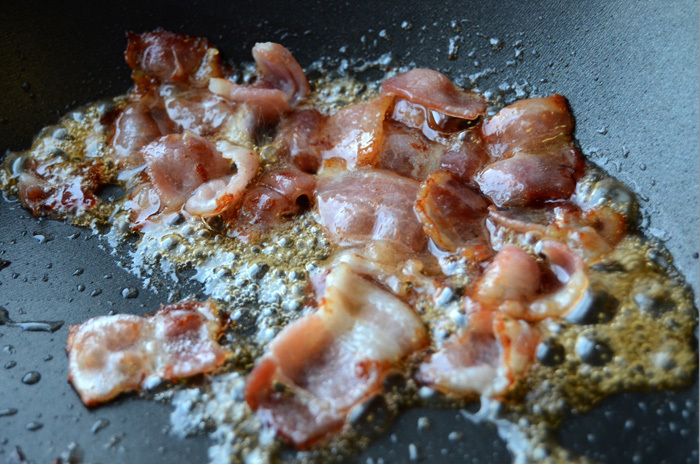 If the bacon is producing a lot of fat, you can absorb it with a paper towel. While the bacon is frying, add a dash of vinegar to the pot and poach the eggs one by one. Stir the water in the pot with a wooden spoon before dropping the egg in the middle to create a whirlpool. Drop the egg gently, close to the water’s surface and ensure it hasn’t stuck to the bottom of the pot by agitating slightly with a slotted spoon. 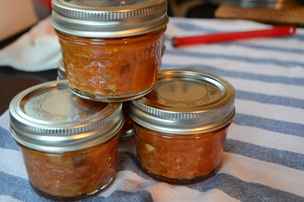 Leave on a medium heat for 3-4 minutes, before fishing them out gently with a slotted spoon onto a small dish. Once the bacon has started to color slightly, add the maple syrup. Take the bacon off the heat depending on your taste, I don’t like them overly crispy. It doesn’t matter if there is still maple syrup in the pan, as long as it has caramelised with the heat. 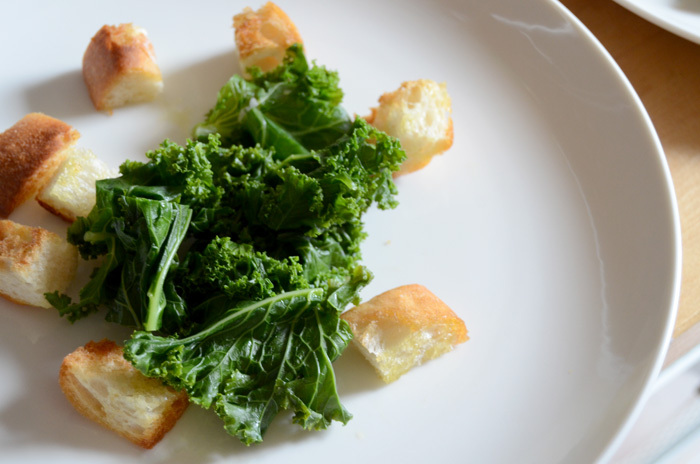 Chop the kale into 5cm pieces and place onto plates with the croutons. 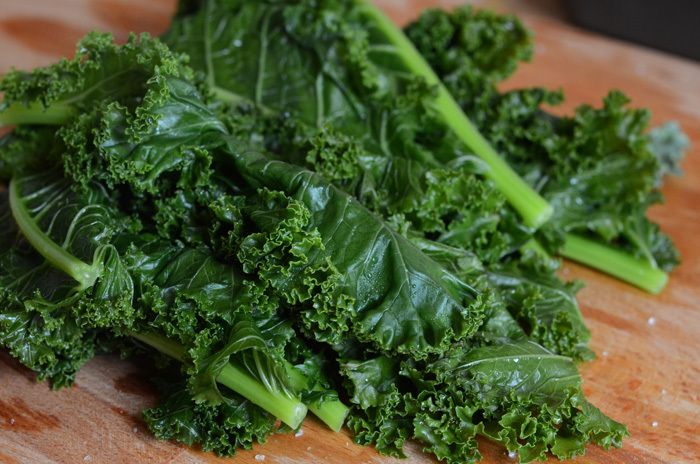 Dress the kale with olive oil, lemon juice, salt and pepper. Drizzle some balsamic vinegar and olive oil onto the croutons. 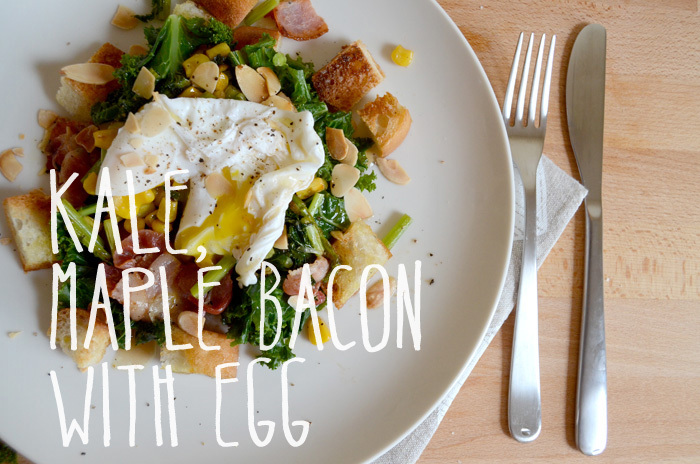 Assemble the whole dish by adding corn, bacon and the poached egg. sprinkle the almonds all around and season the egg with salt and cracked black pepper.